Whether you are currently in the progress of refining your style and perfecting your wardrobe, or still a complete curating newbie: The number one thing you need is a strategy, a clear roadmap to steer you in the right direction, streamline your decision making and help you correct course should you slip up and find yourself lost again between bargains and seasonal must-haves. The ten principles above are a summary of my own strategy and the philosophy that all of the tools and techniques here on INTO MIND are based on. Use them to fine-tune your own set of guidelines, pinpoint your priorities and keep track of your progress! Aim to curate a wardrobe full of garments that you love, that inspire you and that make you feel excited about getting dressed each morning. Every single thing in your wardrobe should express your personal style perfectly, so set your standards high: Good enough's and 'ok's should not make the cut. If you want every single thing in your wardrobe to reflect your personal style, you first need to carve out the exact parameters of your style. So: spend time honing your visual taste buds and create a defined style concept with a clear story line. Instead of bargain hunting and impulse shopping for one-season pieces that you’ll just throw out after a couple of wears, carefully select each new addition to your wardrobe and pay special attention to the fit, fabric, colour and cut of every piece. One perfect sweater is always better than five imperfect ones. There is no single perfect wardrobe, only one that fits your individual style and lifestyle. So stop listening to articles a la “10 things every woman should have in her wardrobe” and don’t waste your time trying to figure out whether you are the ‘preppy’ or the ‘bohemian’ type. Create your own unique look and build your wardrobe around it. The perfect wardrobe not only needs to be tailored to your aesthetic preferences but also be fully functional: your jeans should fit well, your sweaters should keep you warm, your bags should carry your stuff without ruining your shoulder, your shoes should feel comfortable all day. Personal style is above all a means of self-expression. So, have fun with your look, experiment and get inspired by new trends. But: Never follow trends blindly. Instead, carefully evaluate how well a trend fits your individual style concept and whether it deserves a long-term spot in your wardrobe. The time and thought you put into building the perfect wardrobe is far more valuable than an unlimited budget (which only zaps creativity). Invest in your wardrobe by putting in the work: actively define your style concept, figure out a versatile wardrobe structure and hunt down the perfect garments. Your wardrobe should be more than the sum of its parts. Aim for coherence, versatility and a set of harmonising pieces that allow you to express every inch of your style concept and create an outfit for every occasion. Spend as much time as necessary finding items that express your style AND feel good, and never compromise on fit or fabric. You should feel comfortable in all of your clothes, from your PJs to your highest heels. Your personal style can be defined, stable and coherent but it is never static and will continually evolve, alongside your lifestyle and aesthetic preferences. Reassess your style concept and wardrobe structure at least twice a year at the beginning of a new season. 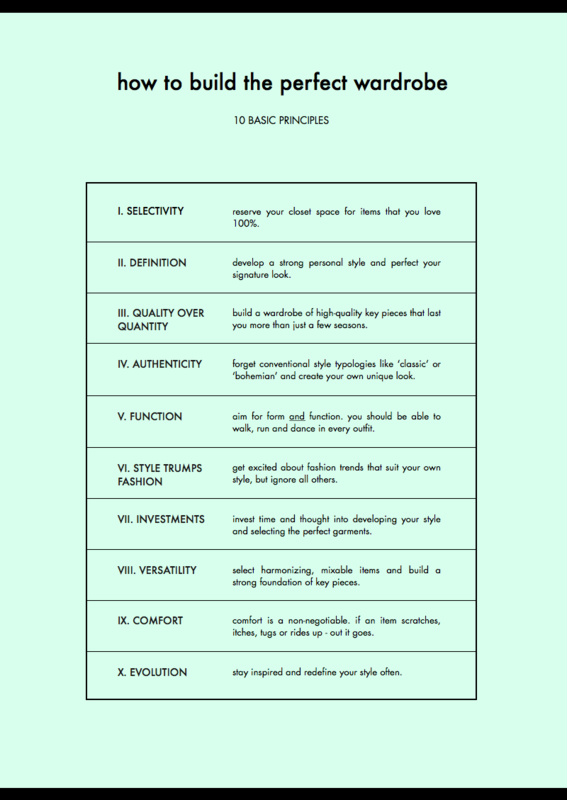 what is your own strategy when it comes to refining your style and building the perfect wardrobe? tell me about it in the comments!